Your BMI , Body Mass Index , is a calculation that is used to determine if a person is overweight that applies to both adult men and women. Although BMI is not perfect because it does not directly assess body fat, it is still considered a reasonable alternative for identify people who are overweight or obese, since measuring body fat directly is a costly process. This BMI calculator will give your estimated number. Enter your height and weight below, then click the "Calculate" button. If your BMI is above 25, losing weight is a smart idea. 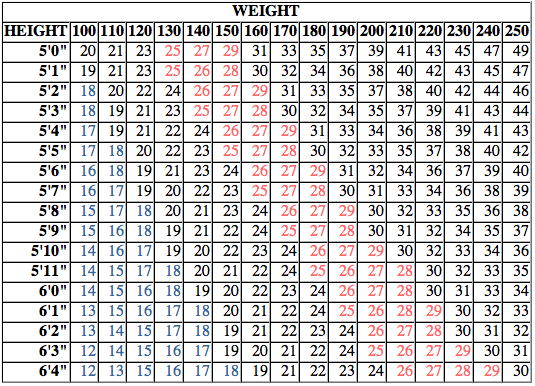 You can also determine your BMI using the table below. First, identify your weight (to the nearest 10 pounds) in one of the columns across the top, then move your finger down the column until you come to the row that represents your height. Inside the square where your weight and height meet is a number that is an estimate of your BMI. For example, if you weigh 160 pounds and are 5'7", your BMI is 25.